Sarasota County Commission Chair Charles Hines was blunter than his colleagues this week in conveying concerns about a nonprofit organization’s desire for the county to contribute to the potentially $100- to $150-million creation of new park and cultural and arts facilities on 53 bayfront acres the City of Sarasota owns. 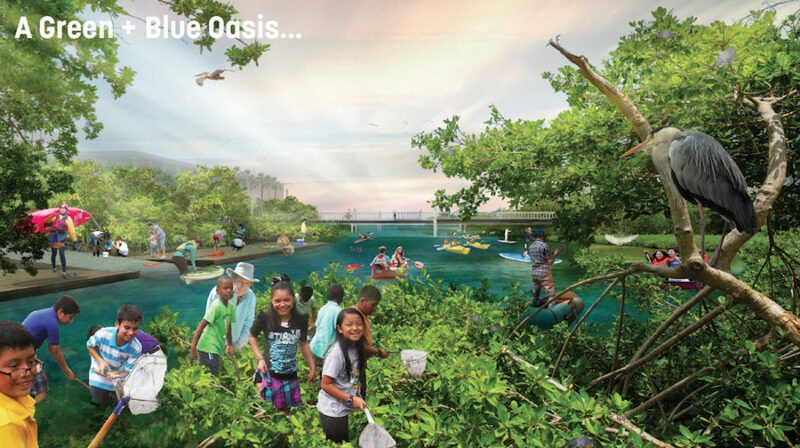 Following a March 13 presentation by Bill Waddill, managing director of the Bay Park Conservancy (BPC), Hines pointed to the fact that the Sarasota City Commission has had several split votes on aspects of the plans for the project called The Bay. Hines alluded to the fact that the City Commission will conduct a special meeting on Saturday, March 16, during which it once again will have to vote on whether the former G.WIZ science museum can be demolished to make way for the vision of Phase One of The Bay. The latter would encompass about 9 or 10 acres on the southern part of the city’s bayfront acreage. The City Commission’s decisions, he stressed, “should be unanimous, that this project is the biggest deal to come to downtown Sarasota ever.” He added that he believes downtown Sarasota never would see a project that would surpass The Bay. Hines further pointed to controversies involving other city-owned properties, including split votes in 2017 approving a lease for the city’s Lido Pavilion and Pool. After public uproar over that proposal intensified, the firm that won the lease — Lido Beach Redevelopment Partners LLC — asked to withdraw from the lease. 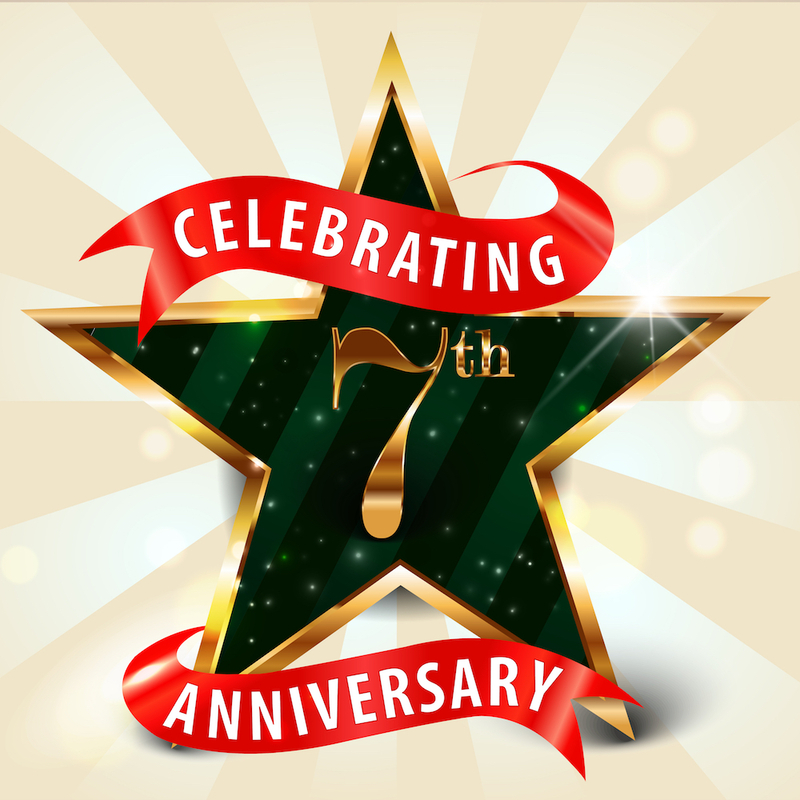 The City Commission on Feb. 18 agreed to that request and voted 4-1 to reimburse almost all the limited liability company’s out-of-pocket expenses for years of work on that project. 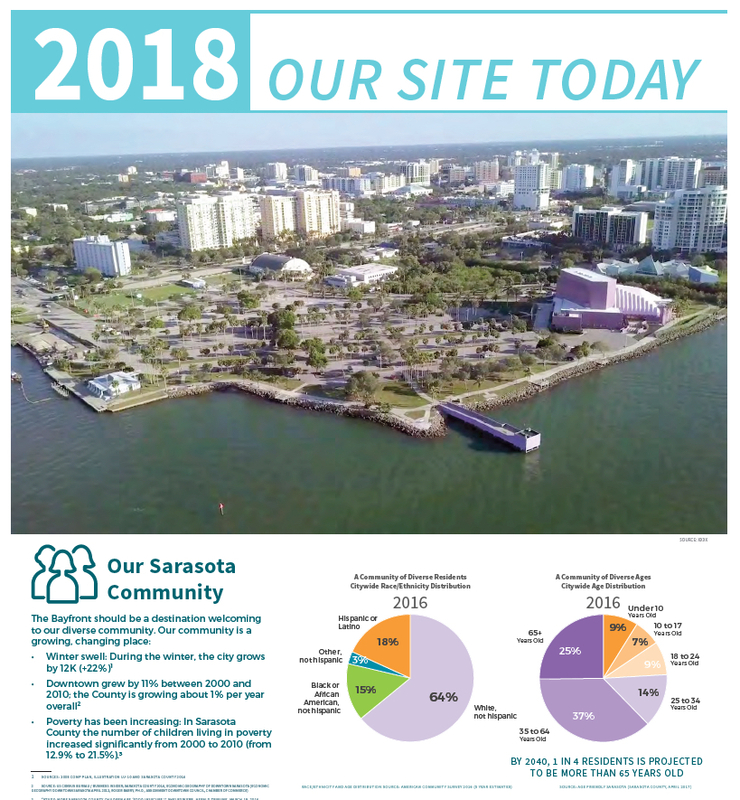 Just this week, Hines continued, members of the public made it clear they do not favor a proposal for the Sarasota Orchestra to relocate from the bayfront to the city’s Payne Park. Before the County Commission entertains a formal request for funding for The Bay, Hines indicated to Waddill, the Bay Park Conservancy needs to iron out all the lingering issues with the City Commission. “I can’t imagine me voting for a 30-year TIF,” Commissioner Alan Maio emphasized to Waddill. Perhaps he would consider approving a 20-year CRA trust fund agreement, Maio told Waddill. Still, Maio continued, the County Commission would have to have significant representation on the board organized to oversee the trust fund for The Bay, and the Office of the County Attorney would have to participate in drafting the CRA documents. Maio further noted his concern about setting the precedent of creating a new CRA, as other jurisdictions in the county have talked of the desire for such a funding mechanism, and the commissioners have been reluctant to grant those requests because of issues related to the Downtown Sarasota CRA. Commissioner Michael Moran asked Waddill for clarification about whether The Bay would be self-sustaining as a result of the revenue it is expected to generate. Ticket sales for events and rentals of pavilions for weddings, for example, would bring in part of the revenue for the maintenance and operation of The Bay, Waddill explained. 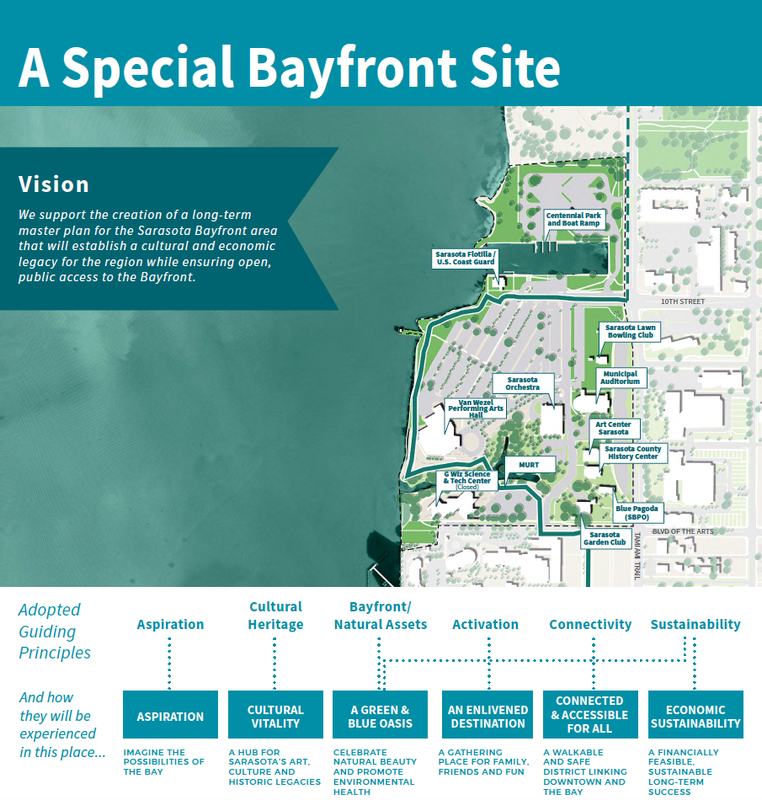 Additionally, the Bay Park Conservancy (BPC) anticipates that, because the City of Sarasota already pays to maintain the 53 acres where the project will be located, that the city will continue to do so after The Bay has been created, Waddill added. Cathy Layton, chair of the BPC, pointed out that the nonprofit has not put anything into writing that says the city or the county would have to cover any funding shortfalls. 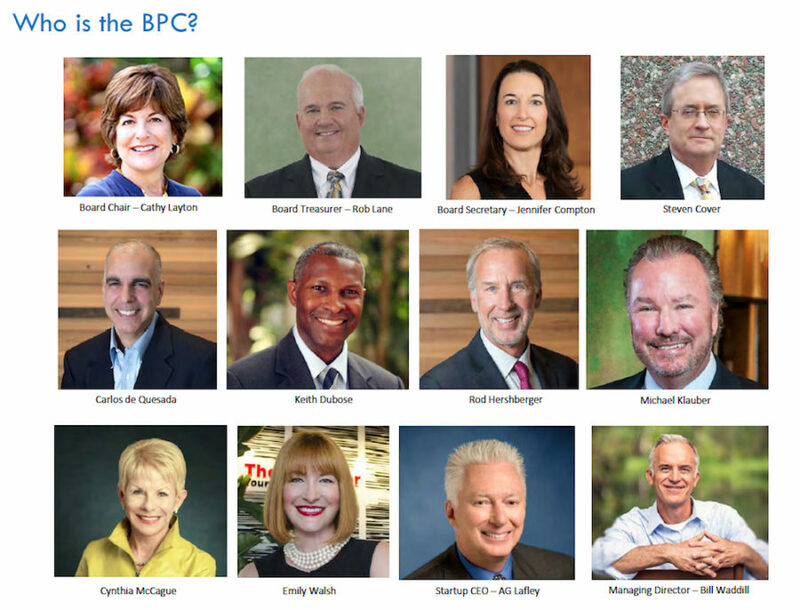 The BPC is focusing on additional revenue potential from memberships, for example, she added — as in a Friends of The Bay organization — as well as corporate sponsorships and philanthropy to help cover ongoing expenses. Commissioner Christian Ziegler concurred with her on the latter comment. During the discussion, Waddill explained that it most likely will take 10 to 15 years to build out The Bay. 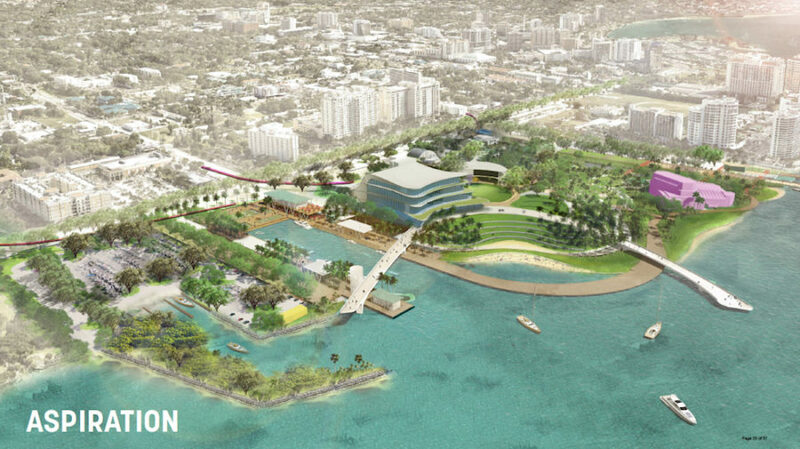 Among the overarching themes the public conveyed to the Sasaki team, he continued, was the desire for an “open, green accessible park” with the ability to see and enjoy Sarasota Bay. 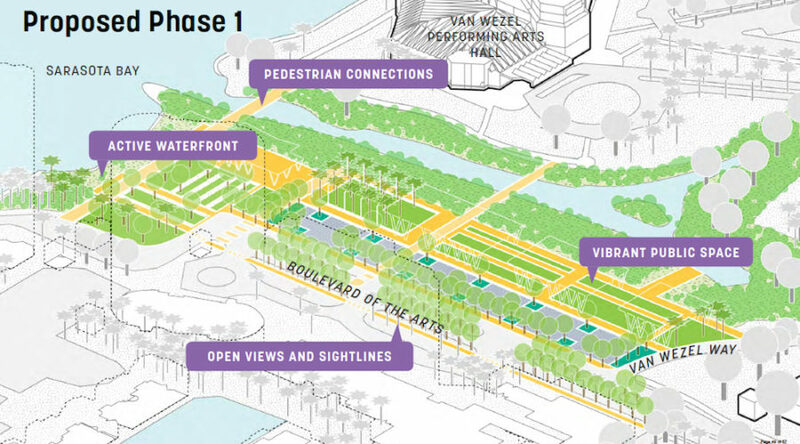 Along with the cultural and arts amenities planned for The Bay, Waddill noted, the project would transform 70% of the 53 city acres into green or pervious areas, instead of the impervious spaces dominating the property, from which pollutants run into Sarasota Bay after rainfall. The BPC expects Phase One of the project to cost about $20 million, he explained. To be able to “cut the ribbon” on that in two to three years, he added, “We think it’s going to be a majority of private dollars [paying for it].” He said the expectation is that 70% to 75% of the expense will be covered by private contributions. Already, he pointed out, the Charles & Margery Barancik Foundation of Sarasota has given the BPC close to $1 million to remove exotic vegetative species from the Phase One area and take other steps to improve the environmental quality of that portion of the site. Projections show that it will cost between $1 million and $2 million a year to operate and maintain the Phase One area, Waddill said. “[It will] probably [be] in the $4 million range” to handle the entire site, after The Bay has been completed, he added. The board members, he added, also believe that 20 to 25 different funding sources will be needed to build the structures on the property, other than a new performing arts hall. The BPC expects 50% of the overall expense of the work will come from private sources, he noted. In response to questions from Commissioner Ziegler — who noted that he is the only one of the county board members who lives in the city of Sarasota — Waddill explained that part of the master plan calls for a new city performing arts venue to replace the Van Wezel. That is expected to cost approximately $250 million, he said, but the Van Wezel Foundation will be raising funds for that project and overseeing its construction. The Bay Conservancy’s role with the latter project, he continued, “is to create a great place” for the new hall. Ziegler also indicated he had heard concerns from boaters, worried that the master plan will impede their access to the water. After holding a special workshop last year for boaters — which was attended by about 125 people — Waddill said that the SBPO had organized a committee of “about 25 or so” boaters who have been meeting to refine that part of the concept for the bayfront. The proposal is to move the city boat ramp to the north, Waddill continued, with expanded parking and amenities, such as new dining options and improved restrooms.